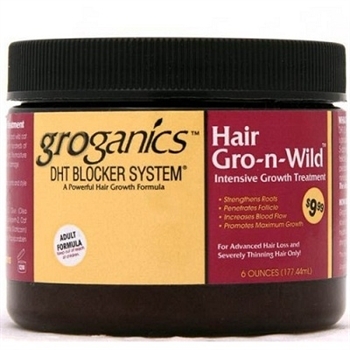 GROGANICS HAIR GRO-N-WILD INTENSIVE GROWTH TREATMENT-Groganics DHT Blocker System Hair Gro-N-Wild Intensive Growth Treatment is a unique blend of wild flowers, herbs, fruit and wild oat extract these all natural ingredients are harvested the same for hundreds of years. This ancient recipe is so powerful it only comes in one strength. This moisture rich complex conditions the hair and restores elasticy to prevent damage. Directions: Apply a small amount to hair and massage. Brush, comb and style as usual.